Highway Entertainment is introducing two new models of motion simulators to their product range. The Orion 5D Attraction is a European made motion simulator that comes in a 4 seat and 5 seat model. Both models offer a variety of different games programs. 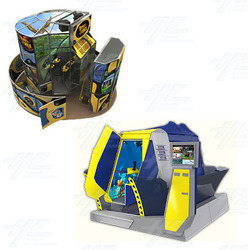 The machines are suitable for all ages and include both entertainment and educational program. The cabinets feature huge 180 degree stereoscopic 3D screens that provide high quality and high contrast images. Adding to the experience of both models is a full motion platform with six degrees of freedom. The moving platform can produce any horizontal, longitudinal and transverse, as well as vertical and rotary motions imitating roll and pitch. Each game or program will take between 3 and 6 minutes (this is operator adjustable). Each seat is equipped with a joystick that can be used for controlling the craft and its weapons, taking pictures of interesting objects and answering quiz questions. The interactive system encourages competition between the visitors. During the game all the participants receive scores for their accuracy in hitting targets, winning races and other completed tasks. Winners are announced at the end of each game. Only one attendant is required to operate the machines. Each model has a payment and control terminal that limits the attendant's responsibilities to switching on the selected program and attending to safety issues. Fur further information about these simulators, please contact our sales staff.